A couple of months back I heard Seth Glier in concert at Rivermill at Dover Landing. Seth is 22 years old but has a depth and profundity to his music that bespeaks someone much older. His opener and the title track of his latest album is The Next Right Thing which, in its own way, challenges us to take the next action that will benefit beyond ourselves … to do the next right thing rather than simply the next thing right which may be just about us. A couple of weeks ago I got some clothing back from a friend who was doing alterations on them. I had given them to her over a year ago. Her life got very involved so that she didn’t finish them last summer but this one. With many apologies and embarrassment, she gave me the bag of clothing. “It was really O,”K I told her (and it really was) and gave her a hug; things happen, and friendships are worth more than delays. When I emptied the bag a few days later, I found a note of apology and five $20 bills folded up as turtles and hearts. She was returning the money I had paid her. Well, I don’t remember if I had paid her in advance or not, but returning it because of the delay was not something I wanted. I knew that we could play the “pass the money back and forth” game and neither of us would win. So, taking the challenge of Seth’s song and in response to a piece I heard on NPR about how expensive it is to get ready for school, I opted to buy school supplies for kids at the elementary school near my house. With backpacks costing $25-$100 alone, I knew my funds wouldn’t go too far. However, since Staples was running 25%-50% off of them, that’s where I headed. I had the cashier ring in items in a particular sequence to see how far I could make the money go. The three backpacks (at 50% off) were $74.97. 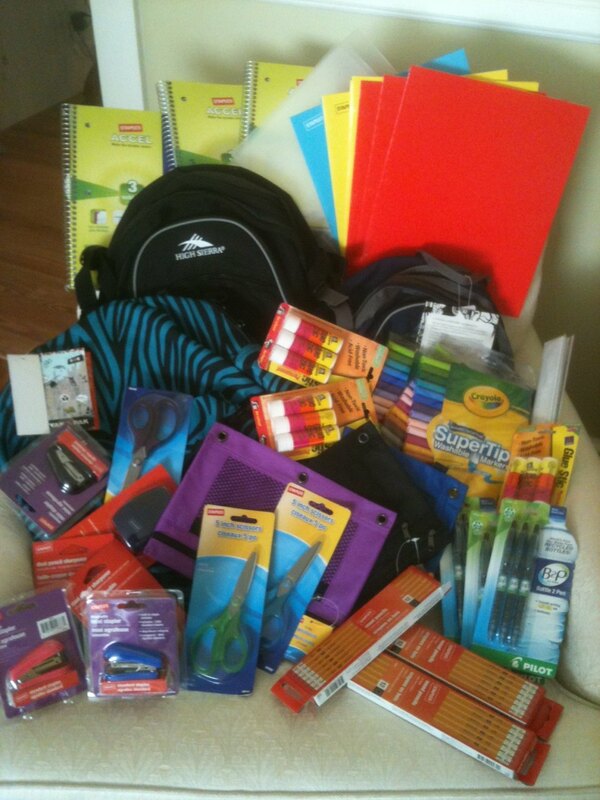 We added notebooks, pencils, pens, glue sticks, folders in a bunch of colors, pencil cases, and so on. Though I hit the $100 mark somewhere around glue sticks, I had the cashier continue with the total coming to $152.06. $100 cash and my Discover card given and I was back at the car. Feeling that I had made “our” money go far, I couldn’t wait till the next day to drive to the school and drop off the items. Well, talk about surprises and confirmation that I was doing the “next right thing,” when I got my mail, in it was a check for $55.62; so my shopping trip was more than covered! While the money was for some online teaching that I do, I thought the arrival date was most interesting and timely. Hmm, wonder why? Now, if I could only be a fly on the wall to see the faces of the kids receiving the items … but then that’s not what it’s about, is it? My challenge to you: Find YOUR next right thing and maybe watch Seth’s video for inspiration. It’s been a long time since I’ve blogged, not there haven’t been lots of issues I’ve thought about over the last months, too many to go into now. In the midst of doing day-to-day things, God manages to send me messages that all will be well, even about the most turbulent things that may be going on in my life. I’m sorry to admit that I think He probably sends way more messages than I actually “hear” as I flitter and float around and spend way too little time being quiet and meditative. It’s a very ancient saying, but a true and honest thought, that if you become a teacher, but your children you’ll be taught. With that, my brain immediately switched gears to Pandora, the on-line music service, wondering what would happen if I put in Rodgers and Hammerstein as a search string – picked up the iPad, launched Pandora, put in Rodgers and Hammerstein, and the FIRST song to come up is Getting to Know You from The King and I. Is that God’s way of saying, “That’s a good idea. And don’t worry about fall, being in a new situation, teaching a new cours. All will be well.”? I sure hope so. I guess even God uses technology. If you’re not familiar with Pandora, you need to check it out! (Pandora.com) It plays even better on the iPad or iPhone than on the computer!! God is good all the time; all the time, God is good. And singing is good for the soul! There are people in my life about whom these words could have been written. The circumstances for each are different and the leadership is often born by walking through the fire of adversity and coming out stronger. May God bless them as well as those who come to mind for you. It’s been quite a while since I have blogged. The days at work have been full with lots of meetings after school. I’d forgotten just how little time one has when working full time – no complaint, just fact. I’m still re-learning how to make it all coordinate. It also seems a bit odd writing in a blog that is titled in part “a journey through unemployment” when one is employed. I shan’t let that bother me, however, as I have felt that many of my comments have been about the common experience, the universal truth, the “everyman” aspect of our lives that goes beyond a particular event, like unemployment, though that was the inspiration for me to put word to paper. I started out wanting to talk about this last day of the year and was curious to learn when January became the first month since I remember learning somewhere, sometime that the year used to start in March (hence, September being 7th month, etc., through December as 10th). Off to Wikipedia I went and learned that January has been used as the start of the year since 45 BC and was named for Janus is the god of gates, doors, doorways, beginnings, endings and time, a most fitting identity. 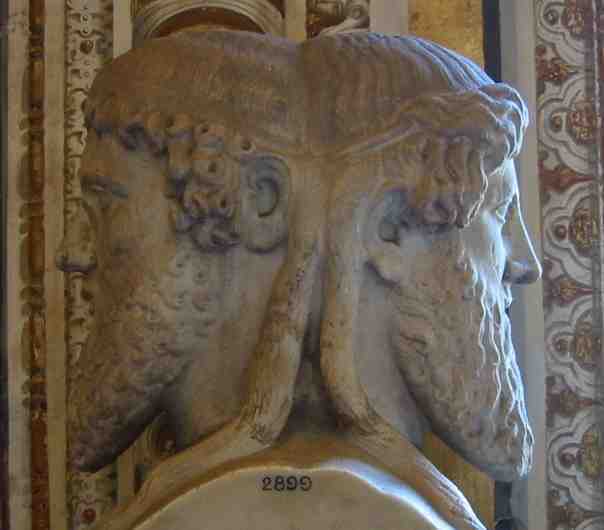 He is often depicted with two faces; one looking back in time while the other face looks forward. I look back on my year. While there are certainly more happy times than sad, I am ready to move on. I am sure yours looks about the same. Some of you have had more joy than you ever expected in one year; others, more sadness. Some may be welcoming a new baby into the world this very evening and some of you may be saying your goodbyes. Some have celebrated glowing reports after months of fighting illness. Some are just beginning that road as the doctors’ reports begin to come in. The list is endless, and only you know where you are on the continuum of life. As I ponder all of that, is there perhaps some deeper meaning to the need to welcome in the New Year with fireworks, loud noises and cheering and to do it precisely at the midnight hour? Do we need a moment in time when we can say, “the old is past away, and the new is just beginning”? Perhaps we do. I wish you peace, love, joy, and especially hope as we welcome in 2011. There’s a small cove along the Piscataqua River that separates New Hampshire from Maine. It sits on the east side of the Spaulding Turnpike with a path along the landside and a number of sailboats moored away from the river’s strong current. I’m told that those moorings are rented from the State of NH at some ridiculously low amount per year and that they have been passed down through families because of that. My breath is often taken away as I come around the entrance ramp and momentarily see that cove at about a 30-degree angle, something not really visible when traveling either north or south on the Spaulding Turnpike. The angle and speed of travel would make trying to take a photo not only silly but also dangerous, although often I wish I could. Occasionally the sun is so bright it blinds my eyes for a moment. Sometimes there is a bit of fog settling just about the water and light enough to still see the boats. My favorite is when the tide is way out so that the land is exposed and wet, the sun shining from the east. Sometimes the fog is quite thick making the boats appear ghostlike. From my view yesterday, most of the boats are now gone. Very soon, the trees will take on their fall finery and then shake the leaves away with the winter chill. The view will be different but no less beautiful. Today’s view was very merely gray as there was fog; but while it was hidden, I stand secure in my knowledge and experience that the sun is still rising in the east. Nonetheless, every morning is a new chance to view Mother Nature doing her work. And so it is with our lives. Each and every day there are examples of God’s love for us. Every day has its own blessings, some repetitive, some unique. It is for that reason that each Seacoast Peers for Careers meeting involved an opportunity to share a blessing for the week as a chance to stop and pause and reflect. 60, 80, do I hear 100? I was pleased to hear that my skills and talents would bring good value to the district. I told my boss that I would have to talk with my husband and pray about whether this was the right move for me. The 80% would have given me one day off per week with Bob. I emailed the Super on Sunday after I felt absolutely sure this was what I was to do and realized that the offer could not be finalized till it went before the School Committee the way the move from 60% to 80% had. So that meant sitting tight till Tuesday, September 21, when hiring the new 80% technologist and moving my position to 100% would be on the agenda. I opted to attend the meeting so I could hear any of the discussion and was dumbfounded when the proposal was tabled for Executive Session. OMG, what’s happening? Although I opted not to stay till the end of the evening, as there were other items that needed to be discussed in Executive Session that might take an extensive period of time, I was delighted to learn the following afternoon that the proposal had passed with no issue. So, after two years, I have been returned to a full-time teaching position very much like the one I left. But there’s one more piece. My old contract called for 10 extra days every summer to work on reimaging computers and taking care of things that cannot happen during the school year. The new contract calls for 20. Go figger …. While my story is nothing like the experiences of Job in the Old Testament, like him, I have been restored to more than I had at the beginning. God’s always full of surprises. Did I ever tell you what I learned from my Amtrak experience? One of the first things you learn, if you are riding on Amtrak for any length of time, is that freight trains have priority, no matter what time of day or night. So, if a freight train is coming toward you on the same track, you are put on a side track. This is called “shuffling” in train lingo. Now, depending how far away the freight train is, you might be waiting on that side track for a few minutes, or in some cases, longer, over an hour. After the freight train passes, you go back on the main track and continue to your destination. The way I figure it … in life….. when a freight train comes your way and it can be in the form of a lot of things, God has a way of “shuffling” you to that side track. It may be for a short time or a long time but when all things are in line according to His plans, He will put you back on that main track to continue your journey that is the purpose for your life. Good Night. Rest well. God is in control. Good words for me then and now.